In a typical year, Britain’s 4,000 pairs of Barn Owls produce roughly 12,000 young and it is estimated that a staggering 3,000 – 5,000 of these are killed on roads. Less than 2% of Britain’s roads are major roads (e.g. motorways and dual carriageways) but that’s where over 90% of Barn Owl road casualties are found. Most deaths on major roads happen in the autumn and involve young Barn Owls in post-fledging dispersal. It is not true – as some people think – that because so many young Barn Owls die anyway, the high numbers of young killed on major roads is unimportant (i.e. even if they hadn’t been killed on a road, they would have died some other way). Our research shows that by the time most young Barn Owls die on major roads, most of those that were going to die of some other cause are already dead. 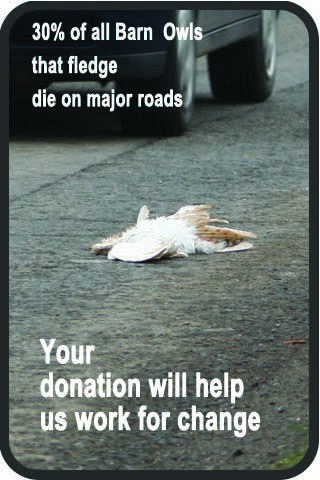 Rather than killing birds that were going to die anyway, major roads primarily kill the ones that should have survived. See photos of unscreened major roads – the worst places for Barn Owl road deaths. Plant high hedges or lines of closely-spaced trees next to the road surface on both sides. Or, plant trees 3-4 metres back from the road-edge and allow the side branches to reach within 1 metre of the road surface. Or, allow road verges to become covered in tall ‘scrub’ thus saving a lot of taxpayers’ money. See photos of roads with planted screens. Owl deaths were frequent along this section of the A483 in Shropshire. This image shows the road with no tree screen in 2004. The same section of the A483 after a tree screen was planted. Birds are forced to fly up and over the screen keeping them above the traffic. Don’t encourage Barn Owls or erect a nestbox within 1 km of a major road, unless it has continuous screens on both sides. The further away the better but even Barn Owls living within 3 km of a major road are likely to be killed. If you see a road casualty and it’s safe and legal to stop please do so. Please check to see if it is ringed. 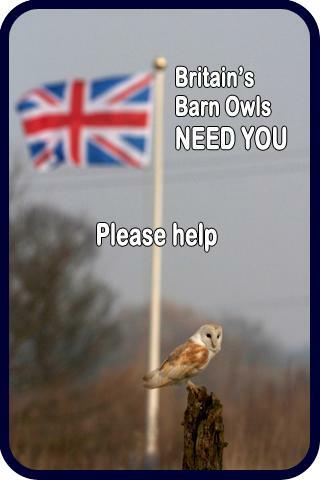 Report all ringed and unringed Barn Owl casualties, as well as live ones, on our Barn Owl Survey website. Report all bird rings to the British Trust for Ornithology. Why are most of the victims young birds? Because they move the furthest. Adult Barn Owls don’t normally move out of their home range, so if their home range has no major road they are most unlikely to die on one. Between August and the end of November, juvenile Barn Owls disperse well beyond their parents’ home range. Some young Barn Owls might establish their own home range only 5 km from where they hatched, while others move right across the UK. The average recovery distance of BTO-ringed birds is 12 km from the parental nest site. Why are major roads so dangerous to Barn Owls? Because of the way they are designed. Barn Owls habitually fly low, especially when hunting. The grassland on major road verges often contains prey and this encourages Barn Owls to frequent the roadway rather than move on. Birds that hunt along a road verge will sooner or later cross the road to hunt the opposite side, as evidenced in the video below. Most major roads have long stretches or frequent sections that are un-screened, i.e. there is nothing to force owls to fly higher before crossing the road. Low flight whilst crossing brings them into contact with traffic. Although rough grass verges make deaths more likely, Barn Owls are also killed on major roads without grass verges. Most Barn Owl road casualties are not concentrated at ‘black spots’. Radio tracking studies and general bird behaviour suggest that dispersing Barn Owls explore new areas when they are not hunting. Therefore they do not disperse along linear habitat features in the way that one or two researchers have suggested. (The idea was that young dispersing Barn Owls follow linear habitat features (such as rough grass river banks) and that black spots are found where these intersect major roads.) Indeed, GPS tracking has recently revealed how birds commute across unsuitable habitats to reach major roads. In our own Major Road Research Project, deaths occurred all along major roads and there were no black spots. 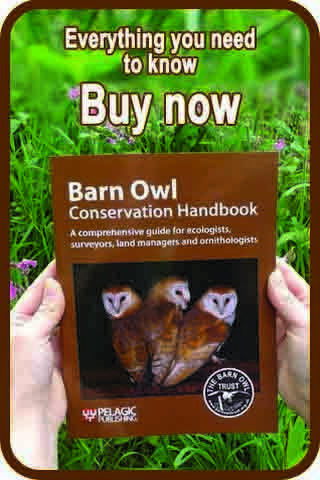 Chapter 7 of the Barn Owl Conservation Handbook is the definitive guide to this subject and covers mitigation measures. Our report ‘Barn Owls and Major Roads, results and recommendations from a 15-year research project‘ provides evidence of the circumstances and importance of Barn Owl deaths on major roads in the UK. Barn Owl road deaths – photo gallery. Unscreened major roads kill Barn Owls – photo gallery. Preventing owl road deaths by screening major roads – photo gallery.